Halloween often involves a lot of pumpkins and creepy Halloween Food Ideas with ghouls and ghosts appearances. On this day, eating meat was not allowed so the food served today is mostly vegetarian. 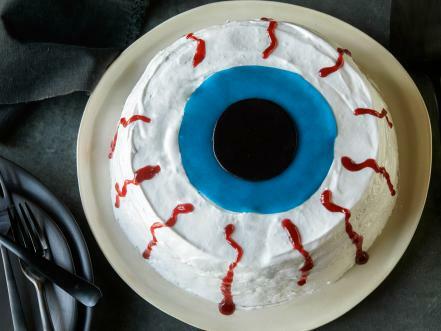 Impress your guests with loads of festive food from creepy appetizers to creative sweet treats. Here are some recipes to blow your mind. Grind 3 cups of cheese puffs finely in a food processor and transfer to a rimmed baking sheet. Take a large bowl and combine 2 pounds of cream cheese, 3 cups of shredded cheddar and ¼ cup finely chopped chives. Add 1 teaspoon of salt and ¼ teaspoon pepper to it. Mix well to form a ball and flatten it by pressing the top of the ball. Now take a butter knife to carve out the sides like that of a pumpkin. After its well done, roll the cheese ball with light hands in the ground cheese puffs so that it gets well coated. 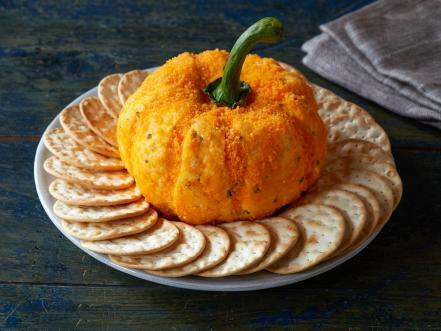 Remove the long bell pepper stem and place it on the top of the pumpkin shaped cheese ball. Finally, take some crackers and place them around the main dish and enjoy! Take ¼ cup of canned pumpkin, add 2 tablespoons of sweetened condensed milk, ¼ teaspoon ground cinnamon, ground ginger and ground nutmeg each. Add a pinch of kosher salt to it and stir to combine. Roll out one pie crust to form a rectangle then cut the crust into 6 equal rectangles and transfer to a baking sheet. Roll out other pie crust, cut them into thin strips and transfer them too on the parchment paper over baking sheet. Add some filling to the center of each rectangular crust. 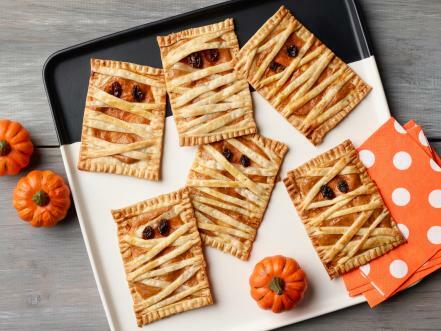 Brush the edges of the pies with egg wash and place the strips of dough creating a “mummy” look. Seal the edges with fork and lightly brush the pie with egg wash. Add 2 raisins to each pie for the eyes. Now we need a preheated oven at 350°F. Place the pies in and bake until golden brown. Once they are done, mummies are ready to eat! Prepare a cake from one 15.25-ounce box white cake mix and bake it in a 10-cup bundt pan. After it’s cool enough, transfer it to a large serving platter. Now take two 13-ounce jars raspberry jam, microwave it until its pourable. Pour this jam into the hole of the cake and reserve the remaining jam. Microwave 4 blue flat taffy candy strips until soft and place it in between two long pieces of parchment. Roll it out into circles then cut it with a biscuit cutter. Now place the black gummies in the middle of the blue taffy circle to create a pupil. Fake two ¼-ounce packages of unflavored gelatin, ⅓ cup cold water and stir well. Combine 1 cup sugar, ⅔ cup light corn syrup, and a pinch kosher salt and ⅔ cup water in a small saucepan. Stir until the sugar is completely dissolved then slowly pour the sugar syrup into the softened gelatin and beat until the mixture is very thick. Add 2 teaspoons pure vanilla extract. Spread the marshmallow frosting all over the bundt cake, let it set until cool. Now place the blue taffy centered on the top of the cake. To draw bloodshot lines on the cake, use red decorating gel. Serve with a butcher’s knife. Preheat the oven to 325°F, spray a rimmed baking sheet with cooking spray and set aside. In a bowl, take 2 cups of all-purpose flour, ½ teaspoon baking powder, and ¼ teaspoon fine salt. Mix well and set aside. Now in another bowl, beat ½ cup unsalted butter and 1 cup sugar together until fluffy and light. Beat in 1 egg and 1 teaspoon pure vanilla extract until smooth. Then add in the flour mixture to form a dough. Using about 1½ tablespoons of dough at a time, roll the dough long and thick resembling a finger. Press a sliced almond into the end of each finger to resemble fingernails and make cuts to form knuckles. Arrange the fingers on the prepared baking sheet and bake until light brown. Dip these fingers into jam to give a bloody look. 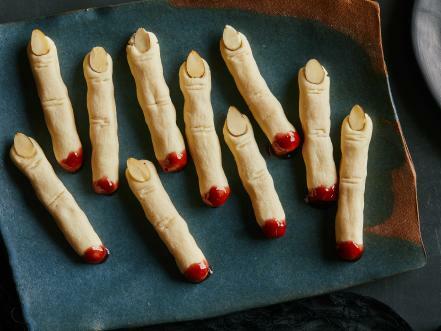 These festive finger cookies will blow your mind. Preheat the oven to 350°F and line a 12-cup muffin tin with paper liners. Sieve 1¾ cups of cake flour, 1 cup granulated sugar, ¼ cup cocoa powder, ¾ teaspoon baking soda and half teaspoon of fine salt into a large bowl. Mix ½ cup buttermilk, ½ cup vegetable oil, ½ cup sour cream, 1 tablespoon red food coloring, 2 teaspoons of cider vinegar, 1 teaspoon pure vanilla extract and 1 egg at room temperature in another bowl. Add this batter to the flour mixture and whisk well and once it’s well incorporated, pour it into the cupcake lines and off to bake for around 18 minutes. In a large bowl, beat the 8-ounce package cream cheese until fluffy and smooth. Gradually add in 6 tablespoons unsalted butter at room temperature and add in 1 cup confectioners sugar and ½ teaspoon vanilla extract. Beat until fluffy and light then transfer it into a pastry bag to pipe it on top of cupcakes. Poke 2 small holes into the frosting to resemble vampire bites drizzle the thin jam into the holes to resemble blood. 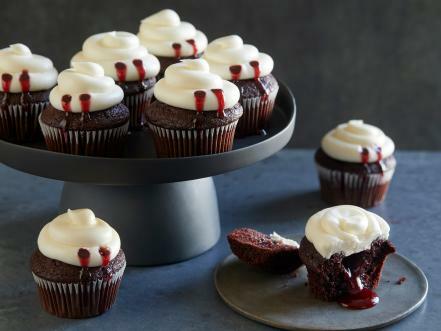 And the Red Velvet Vampire cupcakes are done! Make your party extra special with these Halloween themed delicacies and don’t forget to dress in ghostly costumes!